Discussion in 'Community Chat' started by Raiden, May 29, 2018. Sorry if I posted message in a wrong forum. For last two days I'm trying to sign in on YoyoGames website to download GMS2 Trial. Whenever I try to sign in I get the message that request couldn't be finished because there are too many redirects. I posted a topic on /r/gamemaker, looks like other had no problems. I tried to sign in via Safari, Firefox and Chrome. I also tried to delete all cookies and browser data. What could be the problem? This is something I'm currently investigating. Could I ask you to please try logging in again and take a screenshot of the web console output? There's a chance that an error is being thrown in there. On Chrome, press Ctrl+Shift+I to open up the Developer Tools, then select Console at the top. Thanks for that screenshot, it's really helped a lot. I'm investigating further now, so will get back ASAP with what I find. Ok, so we've identified and fixed the issue now. @zebro @Raiden Could you please try this again? @forsamori Thanks, it works now! Hmm, now I have a different problem. 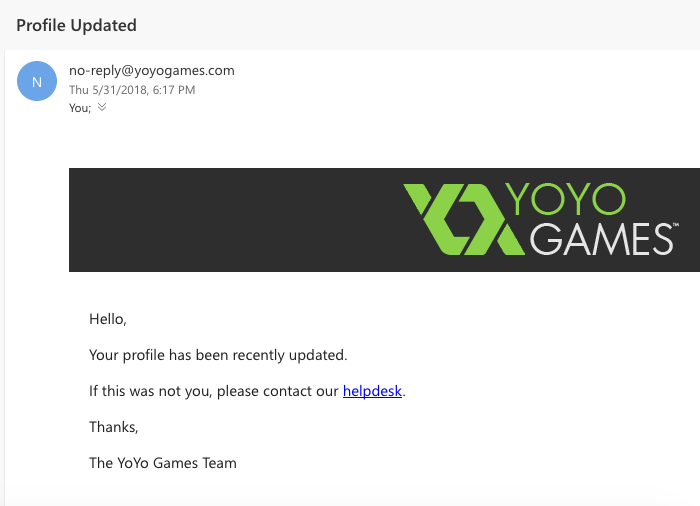 When I go back to YoyoGames page to download the trial shopping cart disappears and it looks like I'm logged out and when I want to download the trial it returns me to https://accounts.yoyogames.com/profile/details with the message to fill out the profile details (You need to update your details in order to continue) even though I already did it. It always returns me blank fields (except for the e-mail). Could you try again using a different browser or incognito/private browsing? I suspect it's remembering session data and redirecting you incorrectly. Yup, I tried that too (Chrome and Firefox, both with incognito). After I get the message that data is updated successfully I try to access other links in the account section (like Password / security) but I'm always returned to the User details section with the message to update my data. Had the same problem, just don't use special characters (ä, ö, ü, á, é and ß for example), the form can't handle this. The best bug is, you can buy/download "GMS 2-only" assets with a valid GMS1 license, you just have to use the right urls (as the buy/download button is invisible). I can no longer even get to the yoyogames website. Yesterday I could not access the login page and today nothing works. I get a 504 error. I have tried Edge, Firefox, and Chrome. I have also tried 3 separate ISPs. Whelp, spoke too soon. Just started working again for me in Firefox. The good news (or bad... depending) is Microsoft Edge works fine on the YYG website. It's not just the website, of which I too cannot access, it's also logging into the app itself that isn't working. Literally every game maker channel online is filling up with angry potsts about getting the no internet error. With no official response on Twitter, this is turning into assetgate 2.0 very quickly. Where are all you guys located? I'm in the UK and have had zero issues with logging in, the website or the MP through any of this, so I can only assume it must be location related. ... so I can only assume it must be location related. I believe you're correct. I'm guessing it's related to the same issue that caused 1-2 minute delays when starting Studio in a previous version. That delay was fixed in a recent update, but now seems to be happening again to some people. Not as bad as before (for me), but there's now 30-40 second delay when opening Studio. I was having similar issues with logging into the YYG website (needed to submit a ticket for login issues with GMS2 on Windows 7), and managed to resolve them by deleting all of the cookies referencing yoyogames.com in the settings of Chrome. Sadly, I still cannot use the software. Weirdly enough, I can usually get to other pages on the YoYo Games site just fine, but the main page rarely works and usually returns a 504 Gateway Error. I'm also affected by the "no internet connection" problem that's been preventing me and a lot of other people from using GMS2 for 4 days now, so they're definitely related in some way. They've identified it an an IPv6 issue.